If you ever want to make a fellow Christian uncomfortable, try this ... when they request that you intercede on their behalf; to pray for them and plead with God to heal their illness or sickness, ask them if you can lay hands on them instead and let the power of Jesus heal them right then and there. Talk about the sins of Doubt and Unbelief! They will most likely stare at you as if you've lost your mind! But who, if they profess faith in Jesus, can say, "No, thank you. I'll pass this time, if you don't mind"? I know how foreign healing sounds to the ears of the Modern Church, but that's exactly what Jesus asked those who would believe in Him [and follow Him] to do. Our Lord spent three years training His disciples in the principles of healing and deliverance as part of their Kingdom work. And He meant for those valuable lessons to be passed down through the centuries of Believers to become a part of each of our ministries for His Kingdom. You have heard me say repeatedly that Jesus has given us His power and authority to do the things that He did -- heal the sick, cast out demons, and preach the Message of God's Kingdom. So I won't belabor that point in this particular blog post -- we will accept that as a given, okay? Today, I want to expand upon that point and discuss how intercession for others through the manifestation of that power results in the ability to heal those with all manner of sickness and disease. First of all, I need to address the subject of "the Gift of Healing" as mentioned in 1 Corinthians 12. The subject of "the gifts of the Spirit" is one that is both fascinating and difficult; oftentimes dependent upon which denominational doctrine you have been taught. We should all be familiar with 1 Corinthians 12:4-7, which says, Now there are varieties of gifts, but the same Spirit. And there are varieties of ministries, and the same Lord. There are varieties of effects, but the same God who works all things in all persons. But to each one is given the manifestation of the Spirit for the common good. Let me share with you what this passage is telling me ... when you read further, you discover what the gifts are: the word of wisdom; the word of knowledge; faith; healing; effecting miracles; prophecy; distinguishing of spirits; speaking in tongues; and interpretation of tongues. Then verse 11 tells us, But one and the same Spirit works all these things, distributing to each one individually just as He wills. Unfortunately, today's Body of Christ believes that each of us is given a specific gift; or if you're really lucky, you might have been given more than one of those listed in 1 Corinthians 12. How many times have you heard a fellow Christian say, "I didn't receive the gift of ____ from the Holy Spirit, so that is not what I've been called to do". But that is not what the Bible says! We need to understand that ALL of the gifts are the characteristics of the nature of the Holy Spirit. He possesses them ALL! And when we receive the Holy Spirit at the time of our conversion [and acceptance of Jesus Christ as our Lord and Savior], the Holy Spirit indwells us, bringing all those characteristics of His Divine Nature with Him. We aren't given a specific gift at that time -- we have them all, and when we step out in faith (i.e., are active in our belief), the Holy Spirit will manifest whatever gift is needed at that time; we will receive the gift we need for that particular situation, and the gift(s) of the Holy Spirit will be manifested through us. The Amplified version of 1 Corinthians 12:4 gives a pretty good interpretation: "Now there are [distinctive] varieties of spiritual gifts [special abilities given by the grace and extraordinary power of the Holy Spirit operating in believers], but it is the same Spirit [who grants them and empowers believers]". Do you see it? These special abilities are all part of the nature of the Holy Spirit, who resides in us. And we are given the authority to use (any or all of) them as the Spirit empowers us and wills it. But what does it mean that these gifts are manifested through us? And how does that pertain [specifically] to one's need to be healed, for instance? Here's the best way I can think to describe it ... when we are confronted with a person's need to be healed, say from cancer, there is an internal disclosure [from the Holy Spirit] to the Believer that it's time to act out our faith. At that moment, we are empowered to reveal the true Divine character of the Holy Spirit, which is to heal. He, who is in us, acts through us to reveal His character, which is from the Father. 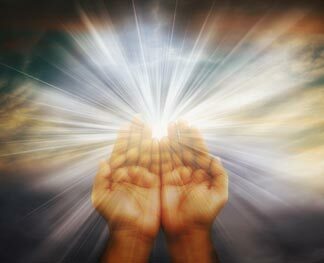 We lay hands on that person, and the power of the Holy Spirit (which is the power of Jesus and the Father) is transferred through us to do the Father's will. And lest you still need convincing, the Bible abounds with Scripture that says it is the Father's will that we be healed ... Psalm 103:2-3; Exodus 23:25; Matthew 8:2-3, among others. But here is what the Church does ... we ask others to pray (intercede) for us and basically, beg God to heal us. There is no demonstration of the power and authority of the Holy Spirit in us. And I truly believe that God wants us to demonstrate that power to the Prince of this world! Instead, the Church's theology has been reduced to a doctrine that either begs God to do the work [for us], or condones intercession as taking on the suffering of others; standing in the gap and accepting the blows of the devil and his demons on behalf of another -- and reveling in the suffering as some kind of honor. God never asks that of us! Instead, we aren't to pray, begging God to heal, but we should stir up the gifts of the Holy Spirit, look in the face of the illness, and demand that it leave, declaring that this cancer is defeated, quoting Psalm 118:17: I will not die, but live, and tell of the works of the Lord! And we have a perfect example of this principle in 2 Timothy 1:6, when Paul says to his "spiritual son", Timothy, "Therefore I remind you to stir up the gift of God which is in you through the laying on of my hands". Paul was instructing Timothy that he must be ever mindful to "keep the flame alive"; that the gift(s) of the Holy Spirit should be regarded as a fire capable of dying out if neglected. 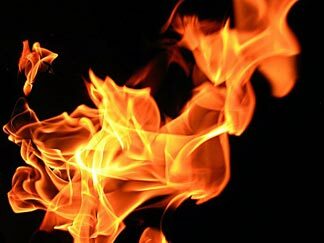 We should take this to heart -- to keep stoking the fire of the Holy Spirit [within us] so that we will be effective in carrying out the Lord's work, as the Spirit empowers us. I also wish to make one point very clear. When you are not in a person's presence, you can absolutely intercede for them, standing in the gap between them and the devil. BUT, if you are doing it in your own power, you can expect that the Enemy will knock you to your knees. In other words, you can expect that the devil will retaliate. But when you stir up the power of the Holy Spirit within you, He will release His power and manifest it through you, enabling you to stop the devil's onslaught. And if the thought of being empowered by the Holy Spirit to take on the devil frightens you -- or if you can't conceive of the possibility that the Spirit can heal someone through you -- I'd like to point out what Paul told Timothy after he instructed him to stir up that very power ... God has not given us a spirit of timidity [cowardice], but of power and love and discipline [sound judgment]. When we receive the indwelling of the Holy Spirit, we receive the very power and authority of Heaven in the person of the Holy Spirit. There is nothing that the devil can do to defeat it [or us]! But we have to be in agreement with Heaven, and keep that power stirred up and active; being a willing vessel for the manifestation of the Holy Spirit through us. So the next time, when someone asks you to pray for them to be healed, do as Peter did in Acts, Chapter Three. When the lame beggar at the Temple pleaded for money to help him relieve his infirmed state, Peter said, "I do not possess silver and gold, but what I do have I give to you: In the name of Jesus Christ the Nazarene—Walk!" Peter was professing that he possessed the power of the Holy Spirit to heal him. Show the sick people in your life [and the devil] that you possess the Divine Nature of the Holy Spirit; and [through your active faith], proclaim Liberty for the captive; and declare the Word of the Lord, that by their Savior's stripes, they are healed... Then expect it to be so. Belle, What your saying is we tend to throw our problems on the floor in front of God and ask him to re-assemble the pieces to the mess we created. He isn't opposed to fixing our messes but he has given us a supernatural arsenal specifically designed to eliminate almost any problem we face and we refuse to believe we have this arsenal and therefore it never gets used. Intercession is asking God to fix the problem while authority is the believer taking the initiative to release God into the problem. Is that right? Yes! God is waiting for us to work with Him, and partner with Him. That is why He originally created us in His image. He doesn't want to be the distant God that lacks relationship while controlling everything. He wants that spiritual connection so He can supernaturally work with us and through us. He has given us the avenue by which we can be true sons and daughters, and joint heirs with Christ, so that, as you so eloquently express it, He can be released into our messes and together, we defeat the devil with heavenly power and authority. Taking that authority to call on His power is the key -- Intercession without that component is doing it in our own abilities, or expecting God to do it for us. Intercession by declaring our authority from Jesus to call on the power of God through the Holy Spirit is partnering with Heaven to defeat the Enemy. And that authority came with the promise that we are sealed with the Holy Spirit. We just have to learn to use it!